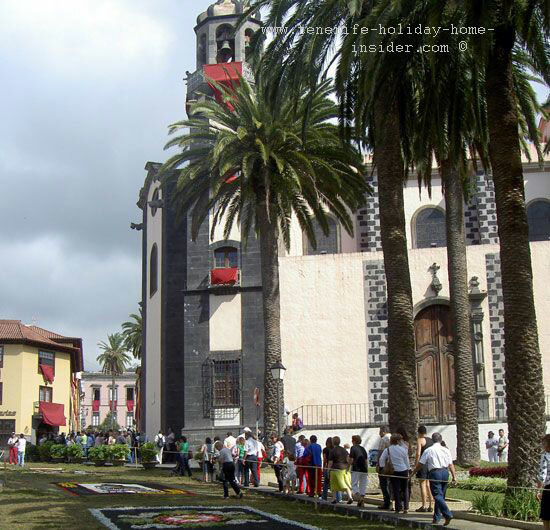 How Corpus Christi La Orotava Catholic traditions unite a town. What is the main reason for the incredible success of Corpus Christi La Orotava? Corpus Christi La Orotava is always unique and full of surprises. Therefor, it's exciting for locals and visitors alike. It always takes place on a Thursday 66 days after Easter Sunday. 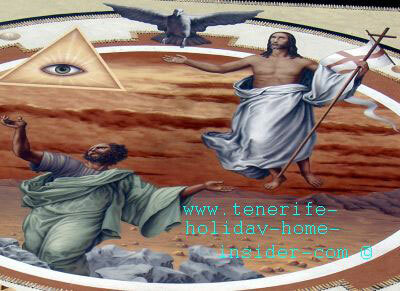 This timing isn't universal by Christian custom, as there may be a difference of six days, even in Tenerife. The same event in 2018 will take place on June 07, also on a Thursday. Every year, about three cobble stone roads in the town's old quarters are dressed with 34 carpets more or less. 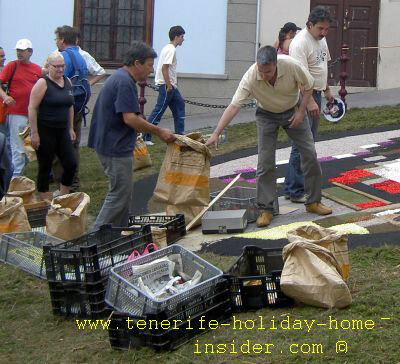 Those so called 'alfombras' are mainly made with flower petals and Brezo that's picked of indigenous brush in Tenerife's National Park. What about the sand carpets of Corpus Christi? There is always only one. It's big and up to now it has always been the best in the world. It's never without a center picture. The street art above shows Christ painted by sand. Flanking images follow biblical themes, such as angels. Very much like in baroque churches... In addition, Symbolic details balance out the composition. However, since 2018, innovative themes have been introduced with this sand art, as can be seen here. No, it only looks like it. It's made with very fine volcanic sand which comes from the Cañadas del Teide at Spain's highest summit. Marmolite is used, very seldom. Why is it fine art? It looks almost like a classic painting of fine art that could only be trumped by photography. How long does the gigantic work of almost 900 m2 take to be accomplished? Some of the preparation work goes on for a whole year. Also, about four weeks before the main Corpus event, a very few experienced artists and some selected students from the art school of the Casa de Cultura start work in front of the town hall. There, the final action takes shape. Its result is the sandy religious symphony of perfection. A single, huge canvas sheet covers it to protect it, while three sides remain open. 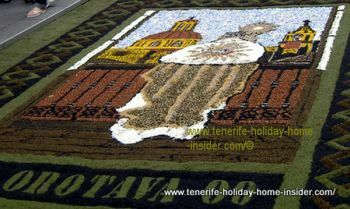 La Orotava's artistic work of sand of 2007 entered the Guinness Book of records for its size of almost 860 square meters. How is it protected from wind and rain? A semi open workshop is created by a roof which almost resembles a tent. 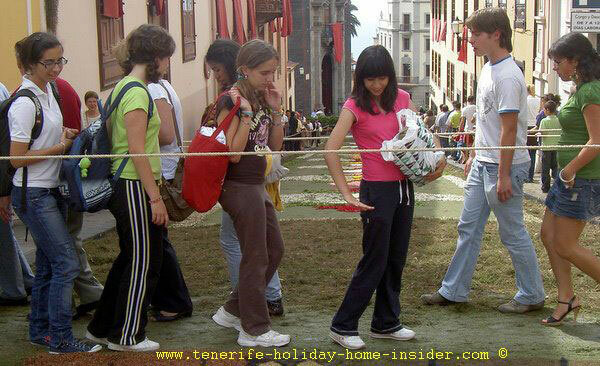 On the day of this important Tenerife Christi event the wide protective canopy is removed. The overall picture of the whole sand carpet may be best contemplated from one of the town hall's three center balconies above it. However, you can only get there on the Orotava day of the Body of Christ. Other such carpets, some of which are made of salt, may be much bigger but, are usually only of an abstract nature, such as in Islamic design. 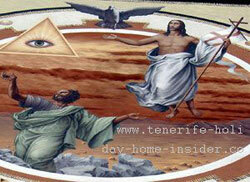 However, in La Orotava realism prevails with its sandy floor cover 'par excellence'. 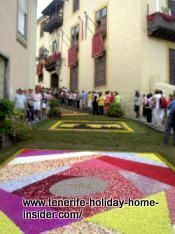 The Corpus Christi Orotava flower carpets. 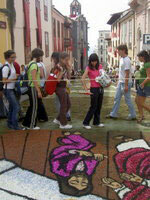 The road which faces the Town hall is buzzing with people who create carpets with bloom petals. Portrayed beside is a row of an entire family. 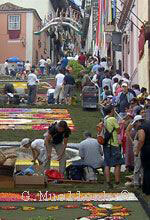 They are almost finished with their work to embellish 'La Carretera' road for the liturgical procession. Their art on the floor is not easy to do, as they have to bend down and will get tired fast. 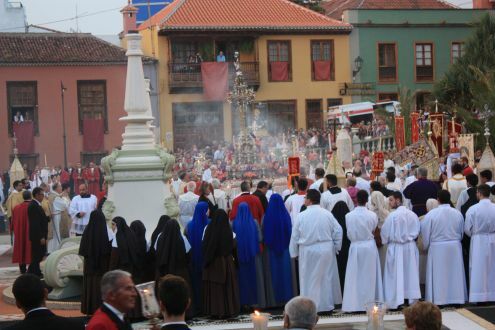 So what about the social aspect of Corpus Christi Orotava? Indeed, this important holiday unites a whole town by a common goal, comradeship and socializing. It removes class barriers and strengthens family ties. 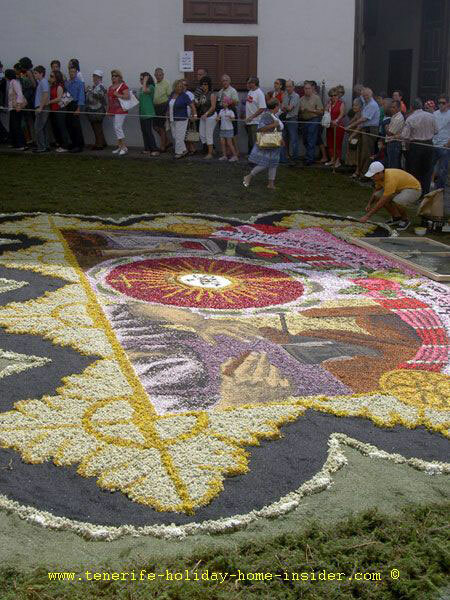 The first flower carpet Christi of Orotava. Portrayed beside is the Monteverde design 2009. It was done by the descendants of Leonor the lady who started it all, 171 years ago. This 2009 'alfombra' keeps its geometric tradition alive. The letters JHS whose meaning is unclear are in its central gray circle. Does everybody do this labor of love for free? No, some of the management committee are employed by the municipality, such as the director Don D.Domingo González Expósito of the 'Corpus Alfombras' who is also a head of the San Agustin Art school. Also there is, at least one more fine art teacher who his paid for helping to pave the way for new talent and the chores for the town's famous Catholic holiday. What about the guys in blue? Secondly, the men and women in blue t-shirts which distribute the material for the flower carpets are likely to be employed. Much collecting, measuring and marking is done in town hall community rooms. That happens long before the creative street work starts. By the way, computer printouts are not used by all to help to stick to a design. Some people keep track by photos, while they work on a more artistic peace or on a more easy 'Corrida' track. Oh and others do the outlay of a carpet with chalk straight onto the street ground, while very few have their drawings on large sheets of paper or cardboard which are spread over the road. What is amazing is that quite a few work by 'free hand'. Hence, they use hardly any tools, such as molds or templates. However you, may see a bucket with so called 'Pergamento' which looks like a resin or varnish. Also duck tape is employed to prevent wind moving paper bases. It's fascinating to not only watch carpet art in the making but, to also see how people help themselves to reach better results as well as to speed up the work. 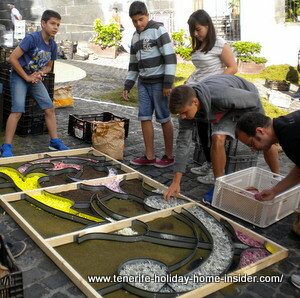 Depicted beside is one of best Orotava family fun activities... This flower carpet is different. Its composition made of blooms is symbolic. The combined image of 3 women, one of which is Caucasian, one African and one Asian represents uniting nations. Orotava flower carpets on a steep hill. La Orotava Hotel Victoria where Richard Hetherington spoils you with gourmet creations. Casa Lercaro with its local and international cuisine but, also with the most delicious cakes. Discover an arched decoration when enlarging this photo. The decor draws to another high light of this street. 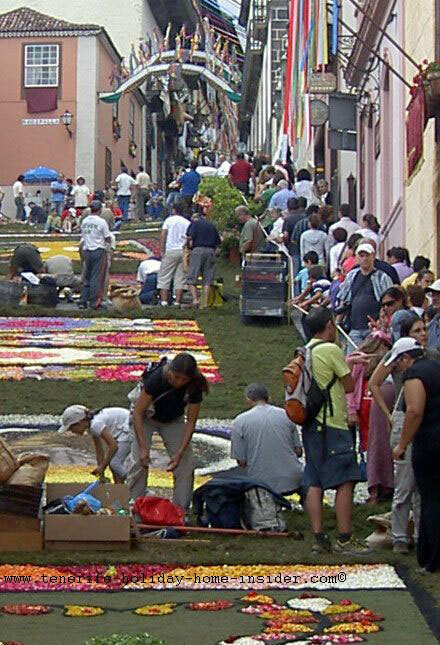 Flower carpets end there by Casa de los Balcones. Its souvenir shop, part of which is related to the Corpus theme, may be open. Artists hurry to finish flower carpets. They look stressed for some unknown reason but, need to be applauded nevertheless. These men keep forms of their abstract art carpet straight with wooden rulers. Molds to fill with flower petals or Brezo. 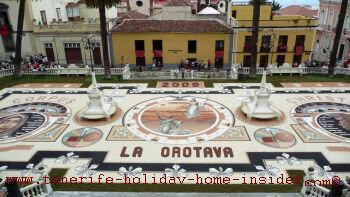 Most of the artists of the Orotava carpets are perfectionists, indeed. However, not all use traditional form templates with the 1 inch high rims. You will see more and more people use such carpet tools by 2014. It's easy to just throw the petal or Brezo material inside them to avoid spills. That's why they became so popular with unskilled labor who do the long 'Corridas'. The forms save much time and let the workers sleep a little longer on the day of the Corpus Christi carpet building. Brezo which had been toasted black produces the dark shades of the dress folds. Also amazing is that skin tones are often done with light pink or Apricot colored bloom petals. Astounding was also a carpet with bell type bright blue flower motives. Agapanthus blooms seemed to have been used. This flower carpet reminded the indigenous rare Violet of Tenerife Island. Notice the words La Orotava 2009 written in this predominantly green and brown floral art. Again, dark brezo was used. On the top left of this street craft is the round tower of church Iglesia de Nuestra Señora de la Concepción in yellow and red. Another temple flanks the focal point. 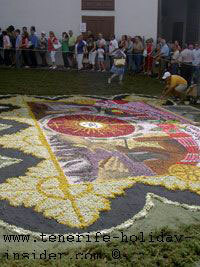 A delicate design is the result of this flower carpet of the holiday of Corpus Christi. Pastel, red, white and brownish petals and plants were taken for this cut flower picture. It portrays sort of abstract art. It is one of favorite styles of this holy day of La Orotava. We passed the main town square again, after we had seen so many different designs of flower carpets. Now, this place of Corpus Christi was bathed in the island's warm sun. You certainly guessed that the flower petals are sprayed with water at least once to postpone wilting. 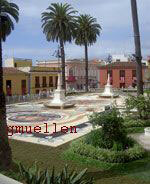 The elegant Plaza of the Ayuntamiento, as the locals call the town hall square looked more beautiful than ever. By the way, the perfect frame and base for the best Corpus Christi carpets of the world was designed by the architect Mariano Estanga. On our way down to my favorite Orotava church, Iglesia de la Concepción, a row of Spanish teenagers crossed our path. Enlarge the photo to see those Spanish girls and boys at the top of Calle Tómas Pérez which connects Plaza de Patricio Garcia and the town hall. They don't only look like they are in a stage set but really seem to be an exception. Why? 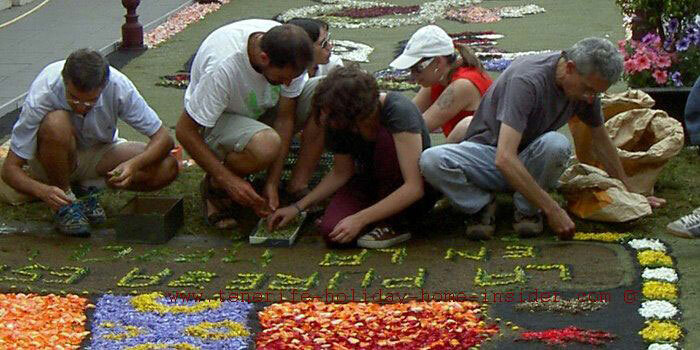 They are not busy to create any street flower art. 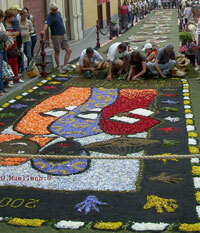 By the way, some of the most breath taking flower carpets are at the town square Patricio Garcia. They make it clear all the more why natives of La Orotava more than often work for free and spend so much energy on temporary carpets. They are so proud of the success of their Corpus Christi art. They thrive on the repeated praise of many decades. The town square of Iglesia de Nuestra Señora de la Concepción has a formal, small park attached. It is like symmetrical, permanent carpet which is shaded by palms. Admire the outside of the church ... Red carpets or sheets swing in a breeze on its facades like on most buildings in the old cobble street quarters of this town. The altar of this temple is where the procession ends later in the day. However, first the 'Monstrance' sacral with its Hostia inside had to be carried over all the town's unusual carpets. Their furtive glamor was yet again to be sacrificed. As so often, an artist was still adding on to it by 6 p.m.in front of his house. Its shape was that of a flower bloom. Its design portrayed abstract art. Its fine borders where made with white flower petals as if nature was representing a lace. This flower art made lovely contrast with gray color. Admire the design's symmetrical forms... They create perfect harmony with various flowery shades. Not all is symmetry in this trophy of modern art. Many onlookers were proof of this intriguing achievement. The artist seemed too absorbed. He was like an actor and didn't seem to notice the spectators. This was the last carpet we saw. After that we passed the building of La Orotava Police. A few steps further down from it, we found an open restaurant in Calle (street) Viera with people sitting and having meals outside. It's name? Tasca Marquesa... It's pleasant to eat on its veranda when you are hungry during the fiesta of Corpus Christi. The food we had was good value for money. It was Eleonor de Castilla in 1847, who started them when she was married to Antonio Monteverde. Over time, more and more high society friends joined her. A breakthrough happened in 1882 when the worker Valladares introduced the 'Saragatas' or 'Corridas' which are long square carpet sections with simple design. Now, the whole trail could be finished much faster for the Body of Christ procession. Corpus Christi procession on the Orotava main town square. All first communion children in their festive clothes are not seen in the photo, as they are positioned by the West side. The Body of Christ is obscured by much incense in the air. By the way from 1906 onward, it also helped when the municipal offices started to organize all materials for the Corpus art work. Links related to Corpus Cristi art as well as its town. Christmas photography, much of which are shots of traditional decoration from La Orotava. Worldwide traditions to celebrate Corpus of Christ.